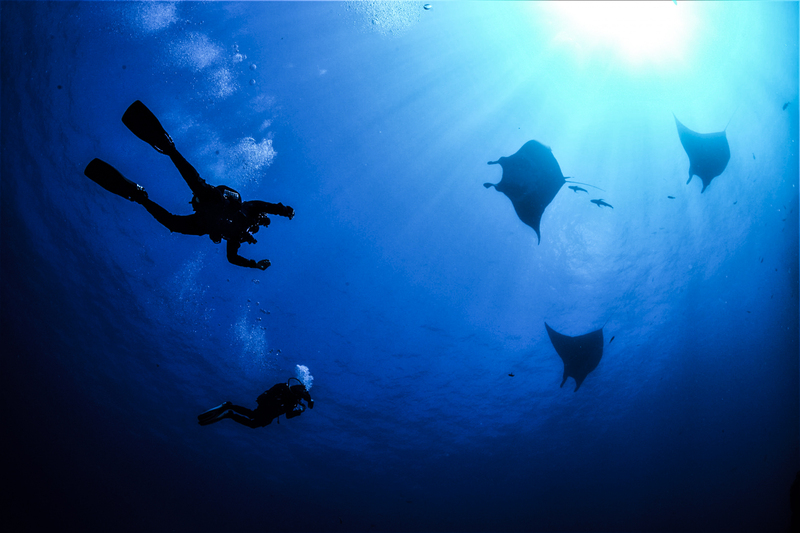 There are not many places in the world where you’ll be looking at a pile of sharks, get distracted by a gang of hammerheads, check your air, then look down to see 5 mantas gracefully dancing beneath you – all the while dodging chunky yellowfin tuna! 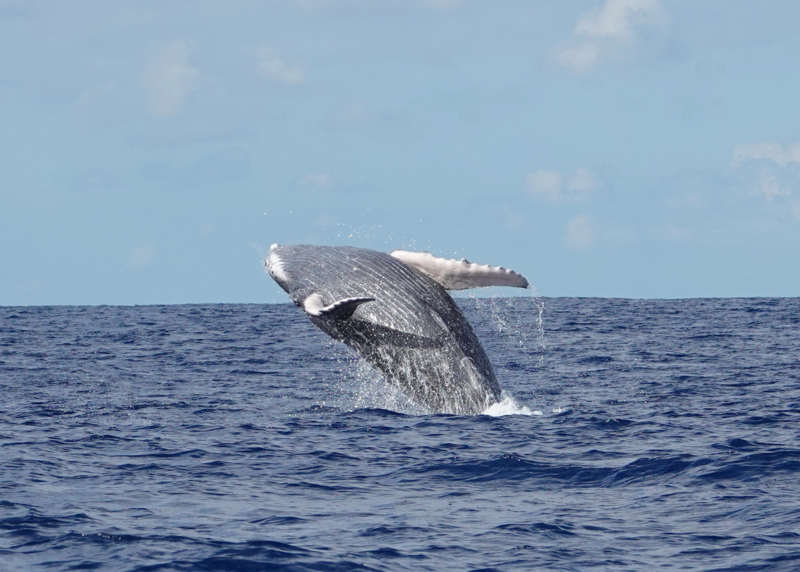 Being treated to the above-water acrobatics of migrating Humpback whales is also a big plus! Thanks Nautilus and thanks for all the fish! The dive this morning at Roca Partida was the dive of my life. So many fish and so much big stuff, really close. So far Revillagegido surpasses my high expectations! 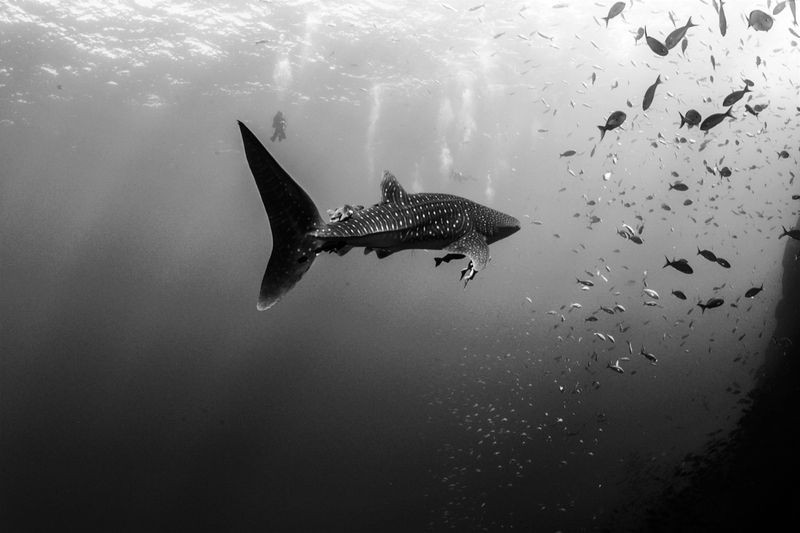 Las cosas siguen mejorando buceo a buceo, hoy nos toco encontrarnos cara a cara con el whale shark!! Si señores, el famoso y tan buscado TIBURÓN BALLENA. Una experiencia inigualable. También aparecieron delfines nuevamente, otro de los animales mas deseados para cruzarte bajo el agua. Y para ir cerrando el día, en el ultimo buceo de hoy otra vez tiburón ballena. Así que hoy, siendo el segundo día del crucero, ya podemos decir que vimos todo lo que veníamos a buscar. Lo que venga de ahora en mas es un regalo de Poseidon y de la vida. La naturaleza nos dio este regalo tan bonito que todos disfrutamos de la mejor manera, cerrando otro excelente día de buceo, con nuestros gritos Sapucay! What an amazing dive trip on an excellent ship! There is so much space on the Nautilus Belle Amie that having 30 divers on board was not a problem. The vessel catered to the guests’ each and every need; we never ran out of fresh water or hot water. And we were a group who showered a lot! The great energy among the crew and their genuine passion for what they do made it really easy for everyone to have a wonderful time on board. Thank you! 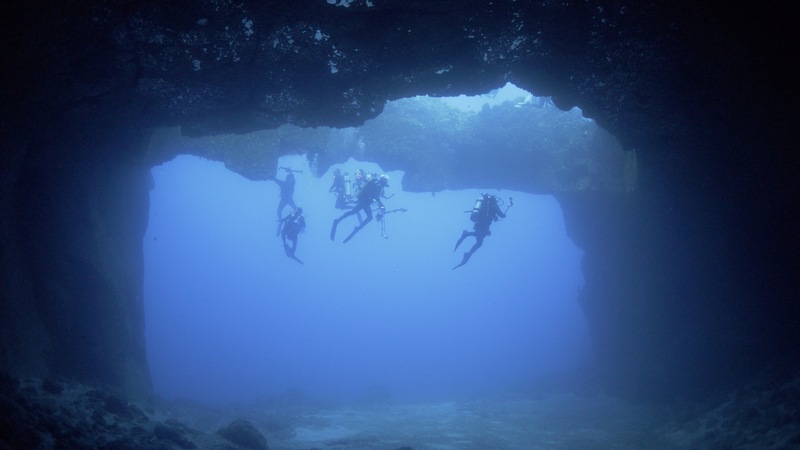 So happy we were able to dive “Roca O’Neal” in Socorro Island since weather conditions don’t always allow for it. We had our first encounter with dolphins! 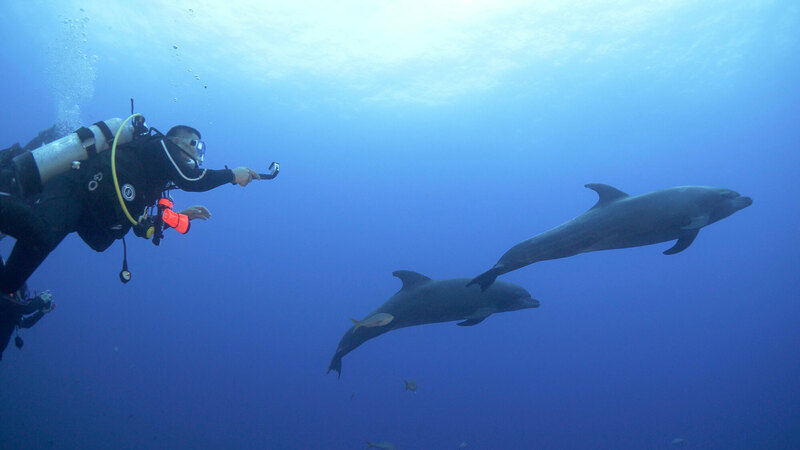 They didn’t stay long and the dive was a bit short as conditions started to change, but it was worth the experience. After that in Punta Tosca for more dolphins! I was so amazed at just how playful they are and how much they loved being around us! Personality to the max! Cabo Pearce Dive 1 started off the day with a sting ray and lots fish. We then encountered a HAMMERHEAD!! It was randomly by itself, but was really pretty. Another Bucket List item checked off the list! Still no mantas, but we’re still holding out hope. Finally in the Boiler, yay! Loads of Mantas. 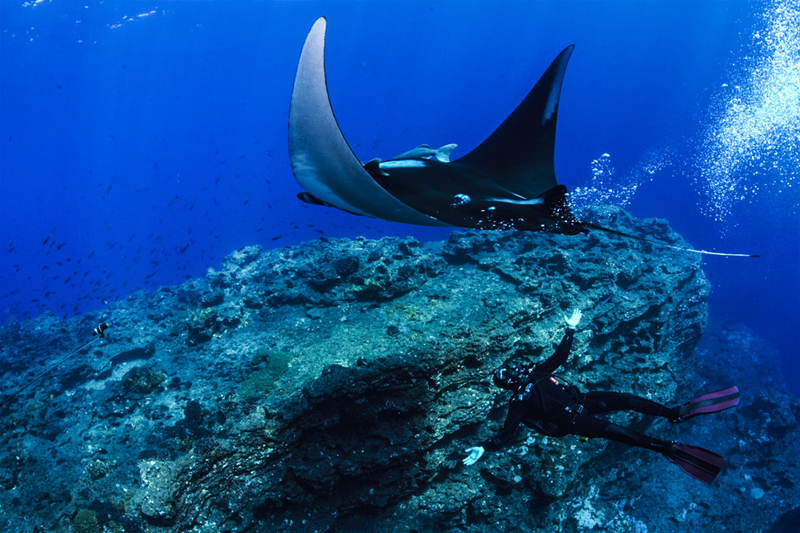 Mantas…Dolphins…and Sharks, Oh My!!! Bucket List for our trip is now complete! This is a very well organized and professional operation. Most of the crew is bilingual and experts in their respective areas. Rodolfo is a marine biologist who lent excellent insight into the marine life we were experiencing. All of the divemasters are competent divers with a superb knowledge of the dive sites and an understanding of safe diving practices. The entire crew works as a unit to make your experience as pleasurable and memorable as possible. Truly a team effort. I highly recommend this trip.